Rocky Mount Academy was born under the guidance of Turner Westray Battle. He along with a group of local businessmen founded Rocky Mount Academy in 1968. Battle served as Chairman of the Board for six years, ending his membership shortly before his death. 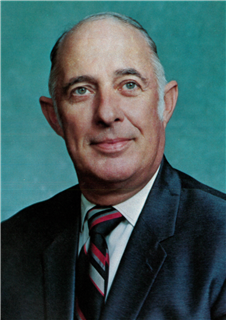 Under his leadership, RMA was fully accredited by the Southern Association of Colleges and Schools in 1973. Battle’s loyalty and love for young people and a strong belief in sound educational practices led Rocky Mount Academy to a position of educational prominence and has provided the Rocky Mount community with a quality college preparatory school. The 1974 Eyrie yearbook was dedicated to Turner Battle for his unselfish dedication to the ideals and high purposes of Rocky Mount Academy to provide academic excellence in insuring its students a quality college preparatory education. Mr. Battle’s dedication to the success of RMA provided the path we continue to follow today. Because of his endless commitment, he left the school strong and vibrant. We continue to be grateful to him for his commitment and loyalty to Rocky Mount Academy. Mr. Battle attended school at Stauton Military Academy in Virginia, Severn Preparatory School in Maryland, and the U.S. Naval Academy at Annapolis. He served his nation as a Naval Officer during World War II, and earned five battle stars in the Asiatic-Pacific Theatre. He was the Executive Director of the North Carolina Wildlife Federation from 1959 until his death in July, 1974. Turner Battle’s passion and dedication to Rocky Mount Academy has continued after his death by providing scholarships to Rocky Mount Academy students. Fellow board members established the Turner W. Battle Scholarship in his honor after his death. This is the oldest and largest Scholarship Fund at Rocky Mount Academy. To date, 205 students have received Scholarship funds. The current trustees appointed to oversee the scholarship trust are Battle’s son, Richard Battle, along with David Warren, and Jeffrey Batts, all from the 1977 graduating class. The criteria for receiving the Turner W. Battle Scholarship are leadership, scholarship, college potential, and school spirit. Trustees of the Turner W. Battle Scholarship Jeffrey Batts, Richard Battle, and David Warren, stand with the scholarship recipients. The 2018-2019 recipients are Haley McCall, Emory Pittman, Colby Freeman, and Georgia Morris (L to R). We welcome donations to the Turner W. Battle Scholarship. For additonal information, please contact Katherine Bryant, Director of Development, at (252) 443-4126 or kbryant@rmacademy.com.